Additionally, we hope the history and significance of this wonderful landmark will inspire new artistic endeavors. If you create something special, we hope that you will share it with this digital library to add to the legacy of the Castle. I grew up as a child of the 50′s in Hamburg and it was actually a treat to go to the Gingerbread Castle..the only other thing more exciting was Bertrands Island..Such wonderful memories…I love those innocent times and memories. Jennie, This is exciting, you are the first person to comment on this newly built Digital Library. Thank you! I was never allowed to go to Bertrand’s Island, but my sisters definitely remember that too. My name is Arleen Jaworski, but I am known more commonly as LEE Jaworski. I was born and raised in Bergen county, and seem to recall a school trip up to “The Castle” when I was quit young. More then anything, I recall the childish thrill of riding the train as many times as I was allowed. Many years later, my family moved to Hamburg, where I became re-aquainted with the Castle. It had been closed for many years, and I was saddened that it had fallen into such disrepair. In the normal course of our lives, we became friends with many Sussex County residence. Among them, Joe and Alice D’Figlia. My daughter Stacie became close friends with Kim D’Figlia, Joe and Alice’s daughter. Kim loved the Castle more then anyone I had ever known, and she announced very early in her young life that when she married her “prince”, she would celebrate it with a reception at the Castle. Time passed, and the Castle remained abandoned. Then a pair of saavy businessmen purchased the castle with the ambitious goal of restoring it to its former beauty, and open it to the public. But one of these businessmen had an ulterior motive. One of these businessmen was none other then Joe D’Figlia, whose greatest wish was to grant his beloved daughter her dream of getting married at the Castle one day. And Joe intended that the Castle would be ready for Kim, when she was ready to marry. A great deal of money was poured into the restoration of The Gingerbread Castle. It seemd no detail was ignored. Because I knew the D’Figlias, and I had a lot of experience in sewing, I was hired by Alice to make the Cotton Candy colored curtains (pink, lavender and blue striped fabric) for every window and door of the hall across the street fron the Castle, where the post cards, cookies and other souveniers could be purchased, along with lunch and tickets to th tour. I was also hired to make the Gretle costumes in the same pastel colors. This costume consisted of a fancy pinifore style apron with a small mop top hat. For Hansel, I sewed a bib front to shorts, and attached a brand new, colorful patch of the “new and improved Castle” to the bib. The young tour guides looked adorable, and seemed to enjoy their new outfits. Meanwhile, it took Kim longer then expected to find her “prince”, but, alas, he finally came along, and they were married at the Castle, just as Kim had always dreamed. My part in the history of The Gingerbread Castle, was small and fleeting, but I was happy and proud to be a part of it anyway. Unfortunately, this story does not have the fairytale ending we all would have liked. Kim was happily married and expecting her first child when it was discovered that she was suffering from advanced cancer. She survived long enough to give birth, but passed away soon after. The loss of his beloved daughter took a terrible toll on Joe, and he too died too early. His wife Alice followed a few years later. I wonder if, in the quiet of a calm spring evening, we might hear the laughter of young children in the dimness of these closed buildings. Would we smell the light scent of gingerbread baking in that big oven? Would we feel the presence of all those generation of people, young and old, who loved the Castle. I believe, if we are still enough, and quiet enough, and open-minded enough, we might hear, or even see the shadows of the past come to visit. If fairy tales were true, this story couldn’t be as eloquently told by you. I’m saddened for the loss of your good friends. Oh yeah, Bertram’s (sp) Island was also a special treat and of course, on muggy twilight excursions to the drive in, such excitement we’d feel! I can’t recall, ever since my childhood, having such strong, almost uncontainable expectations of joyousness! My mother was a Gretel at the Castle when she was a young girl as was my daughter when Joe D’Figlia reopened it. I was pleased to see the post from Lee Jaworski telling how she made the costumes for Hansel and Gretel. I always wondered who did them because I was also hired to do some costumes at the time. I made the dresses for Bo Peep and the Story Teller who sat in the giant chair. They were a challenge because there would be one of each dress and they had to fit several different girls so I devised a method of adjusting the sized using ribbons that would be strung through them. My father always chuckled about being the only Hamburg resident who had never toured the castle in spite of the fact that he worked at Plastoid for many years. I lived next to the mill for a year when my kids were small. We would play in the yard. I would look up at the mill and could swear I could see shadows walking in front of the Windows! I always thought it was cool! Another time I was walking to Hamburg school. Walking past the Gingerbread Castle, I heard children’s laughter. I saw a small child run across the road! Here in our enchanted forest, Hansel and I have found this castle, made out of real gingerbread. You can see from here, that they are real cookies, real candies and even real icing on the peak! 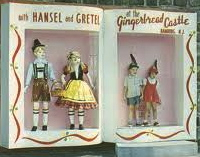 It’s been over fifty years since I was Gretel, but some things you never forget. Great times and great friends. Judy, Ginny, Yolanda, Skip and Chubby….we did have fun! It is wonderful that you still remember this magical place. Thank you for posting. In 1965 our family and a few others from our church went up to the Gingerbread Castle together. I remember walking up the stone stairs inside the castle that overlooked the witch and her cauldron. The guide told us, “If you touch the wall, you will turn to stone”. Of course one of the older boys thought that was stupid and went to touch the wall when his younger sister cried out, “No Brian, don’t touch the wall! Don’t touch the wall!” and she started to sob. I think Brian’s dad gave him a little whack and told him not to scare his sister like that! Then we rode home in the way back of the station wagon. Almost 50 years later, “Touch the wall and turn to stone” is still a family catch-phrase! Thank you for posting. I will post your response now. I am happy you remember the Castle.